With over 300 different varieties, we leave nothing to be desired for our customers. Whether a delicious strawberry or a savoury type of tobacco - you will find everything quickly and easily. Our e-liquids are made of high-quality raw materials, manufactured to the highest standards and are both TPD2-compliant and laboratory-tested. No one knows your taste better than you! Create your own personal e-liquid using our various high-quality flavours. There are no limits to the combinations. Feel free to mix the incomparable taste of our products at home by yourself. All flavour bottles are provided with the correct dosage! As a matter of course we provide you with carefully selected and high-quality raw materials. All bases are laboratory-tested. They come with a guaranteed first filling quality and therefore have a neutral taste. We offer you different compositions of the bases - no matter whether large clouds or intense taste, here you will find the right base for you. In order to easily reach your nicotine level after the implementation of TPD2, we offer you a combination of so-called "nicotine shots" in 10x10ml and bases without nicotine in larger containers. You can easily find out your mixing ratio to realize your nicotine level by checking out our mixing tables in the respective product view. Our large selection of bottles, syringes, cannulas and more allows you to mix your bases and flavours easily, cleanly and quickly. Our mixing/measuring containiers and syringes in many different versions allow mixing with millilitre accuracy. Propylenglycol is approved as food additive in the EU and known as E 1520. Among other things, it is used for medical products as a carrier for flavours. Glycerin is approved as food additive in the EU and known as E 422. Because of its water-binding properties, glycerin is often used in cosmetics and food. Purified water, purer than distilled, for the perfect liquid. Another reason for the excellent GermanFLAVOURS quality. Nicotine is a neurotoxin. It is necessary to prevent skin contact with bases containing nicotine. In the event of accidental contact, wash thoroughly with water. Avoid contact with eyes, do not swallow. Do not eat but dispose foods or drinks in case they have been in contact with bases containing nicotine. Legal information on the use of our bases: These products are legally chemicals. These chemicals are used to produce refill fluids for electronic cigarettes and e-liquids. These chemicals are only offered and sold to expert buyers for this purpose. The proper use and further delivery to third parties is the responsibility of the buyer or reseller. These chemicals are not medicinal or foodstuffs and in the form we offer are not intended for consumption by an end user. We do not give any binding preparation or dosage instructions. Use and handling is at your own risk. GermanFLAVOURS is not liable for damage to health, e. g. through improper use or handling. These products may only be ordered if the buyer has the necessary experience in handling these chemicals and raw materials and is of legal age (18 years). Consumption of nicotine-containing eliquids damages health. Which base is the right choice for me? Since many new customers do not know at the beginning which base is the right choice for the first own creations, we would like to explain the differences between the bases on the basis of some criteria. Bases consist mainly of the four substances PG (propylene glycol), VG (glycerin), water and optionally nicotine. PG is used as a flavour enhancer, the VG content determines the steam properties, water is used as thinner and the amount of nicotine determines the flash and the efficiency. A pure PG base provides an intense taste, but does not steam and is very diluted, which can be dribbled very quickly. A pure VG base provides voluminous steam, but needs much more flavour to ensure good taste. In addition, pure VG is approximately as viscous as honey and only suitable for the fewest tank evaporators, since it can be fired due to insufficient flow. The composition of the base has a great impact on the steaming experience. The VPG base is our standard base. This is also used for our liquids and consists of 50% PG and 50% VG. Steam output and taste experience are most balanced here. In addition, the VPG base is equally suitable for all evaporator models, as it ensures sufficient post-flow on all current evaporator models. Our flavour recommendations are always based on VPG. Another popular basis is the Traditional Base. This was very popular in the past, as most evaporators had much worse affluence properties than today. Due to the water content, the traditional base is thinner than the VPG base, but there are more deflagrations - crackling and spraying. Due to the higher PG content, traditional-based liquids taste a little more intense than with the VPG base, with the same flavour dosage. With the Traditional Base you can use a little less flavour than 0,5 1% less. Our Velvet and VG 86,5 bases are diluted with water VG bases. These bases are especially suitable for people with PG incompatibility. Many allergy sufferers have problems with PG. Problems with VG are not yet known to us. 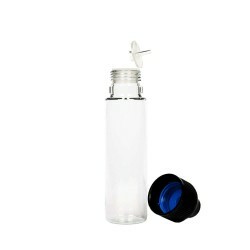 Since the pure VG base is too viscous, we offer these variants diluted with water. Whoever wants to decide between Velvet and VG 86.5 should always choose the VG 86.5 first, as Velvet is very thin (because of its higher water content) and the VG 86.5 base can still be diluted in case of doubt. Monday - Friday: 07.00 a.m. - 06.00 p.m.
Monday - Thursday: 9.00 a.m. - 02.00 p.m.
& 02.30 p.m. - 03.30 p.m.
Friday 9.00 a.m. - 01.30 p.m. 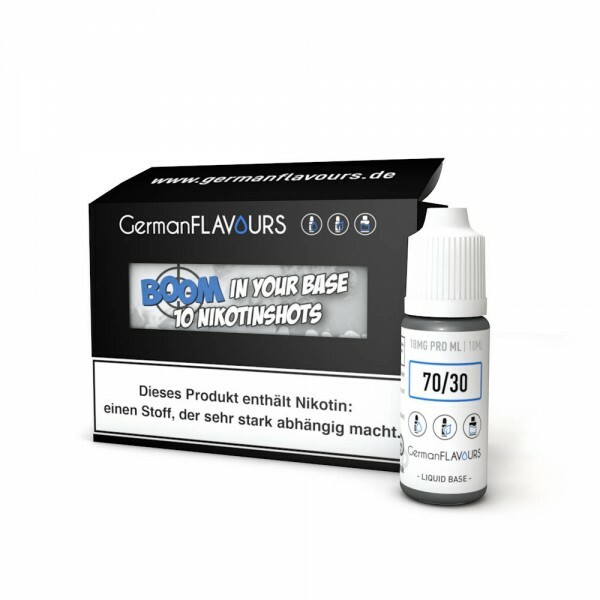 Welcome to GermanFLAVOURS, Germany's online shop providing you with the largest variety for e-liquids and flavours. 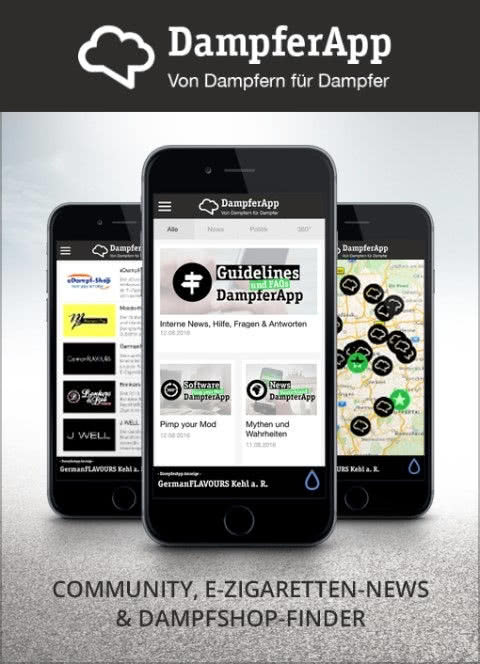 *Applies to deliveries inside Germany. Please check this page for delivery times to other countries.